It is hard to believe, but my little booger is now almost three weeks old. Overall he continues to be a good natured little guy, but last weekend decided that he didn’t want to sleep well at night any more. We are not sure if it is reflux or just him being generally irritable, but for the last week, he has refused to sleep much in his bassinet when it is time for adults to be sleeping. Of course last night when his Nana came to visit and he was a perfect gentleman while he slept in her room so Allen and I could get a full night’s sleep. We will see what tonight brings:) It is also hard to believe that Nathaniel has gained an additional pound since reattaining his birthweight. He is now almost 9 pounds! One of Allen’s favorite games with him now is to have Nathaniel make muscle man arms and then growls “beefcake!, beefcake!” It is quite amusing! Well, speaking of Nathaniel, he is looking for some cuddles so I must be off. I leave you with a picture of the Beefcake and wishes for a wonderful holiday! Great to hear Nathaniel is doing well. Love the photo… have a great Xmas! He is so adorable. Glad he is doing well. Wow, he’s a cutie!! I hope his not sleeping through the night is just a blip and that he’s back to his normal routine soon! Too cute!! 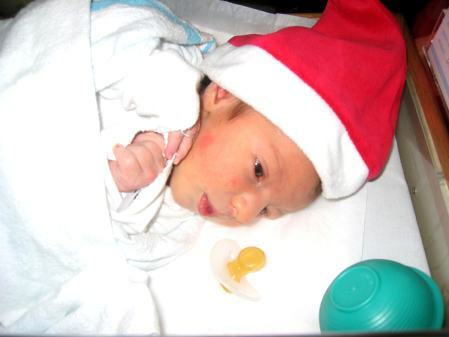 Merry Christmas – it will be so fun to share your first Christmas with Nathaniel!! Beefcake…love it. He’s just too cute! Merry Christmas and keep the munchkin pictures coming. Nathaniel is so beautiful!! I’m sure you had a wonderful Christmas together 🙂 Happy Holidays! He’s so sweet! Congratulations again on the new addition! Awww Beefcake is just adodrable! I hope you had a great Chrsitams! Your little man is just so cute. I hope yo had a great Christmas and I hope you have a happy new year. What a sweet photo! I hope he gets back to sleeping better soon! newborns on average sleep 16 to 20 hours in a day…i cant help but crack up when it comes out…what newborns??? who’s having these newborns that sleep so much?? ?